Disney Cruise Line has just unveiled new itineraries for summer 2017! This exciting summer season features new itineraries and new ports, including first-time visits to new destinations in Alaska and Europe. Watch this video to learn more! Set sail on a vacation full of discovery, adventure and culture—summer 2017 itineraries have been released and exciting ports of call across Alaska, Europe, and the Caribbean are just begging to be explored! 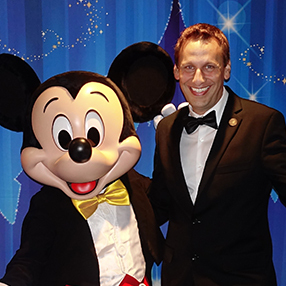 When you travel the world with Disney, you’ll experience impeccable attention to detail, distinctive service and original, award-winning entertainment. Disney Cruise Line truly offers something for everyone—from Broadway-style musicals to family-friendly activities, kids’ clubs, adults-only lounges and more. Your perfect paradise awaits! Bookings open to Platinum and Gold Castaway Club Guests April 13 and to all other Guests April 14. Please contact me for a free quote or for more information. Celebrate something special with a weekend jaunt from San Diego to Ensenada—a captivating city known for its stellar surfing conditions, innovative cuisine and legendary hot springs. Coast through hypnotic landscapes during your 5- , 7- or 9-night journey to charming towns, including Skagway and Ketchikan—select cruises include a peek at Hubbard Glacier and a stop at Icy Strait Point. Drift across crystal blue waters and explore scenic cities like St. Petersburg, Helsinki and Stockholm. Plus, stroll through the storybook-like streets of Amsterdam during a new 10-night sailing from Copenhagen to Dover. Glide past mystical fjords and colorful coastal homes on a 7-night adventure from Copenhagen to 4 Norwegian towns. Or take a 10-night roundtrip from Dover, England, which whisks you to Iceland, Scotland and a pair of captivating Norwegian port cities. Traverse the spectacular Inner and Outer Hebrides off the west coast of Scotland on a 12-night roundtrip adventure out of Dover that travels to ports of call throughout England, France, Germany and Ireland. Spice up your summer with a roundtrip cruise from Barcelona. Itineraries ranging from 5 to 10 nights invite you to roam the bustling streets of picturesque cities in Spain, Italy and France. And you can reflect on each one’s distinct character as you recharge at sea. Delve into the rich history of several port cities—including the newly added Portland, England (Stonehenge) and Amsterdam, Netherlands. There’s a bounty of sights for you to discover over the course of your 15-night sailing. Take rest and relaxation to the next level when you choose a brand new 10- or 11-night itinerary from Port Canaveral that transports you to idyllic islands like Aruba, Barbados and Curacao—each boasting a diverse array of land and sea activities. Surround yourself with crystal blue waters, powder-soft beaches and nonstop family fun on a 6- to 7-night cruise leading you to treasured islands like Tortola, St. John’s and Castaway Cay. Soak up the natural beauty and vibrant cultures of 3 tropical ports of call—Cozumel, Grand Cayman and Falmouth, Jamaica—during a 7-night roundtrip cruise from Port Canaveral that includes a fun stop at Castaway Cay. Navigate your way to the tropical shores of Nassau and Castaway Cay. Plus, enjoy an extra dose of Disney’s private island-a series of 4- and 5-night “double dip” cruises grants you 2 fun-filled stops at this beloved retreat. Savor top-notch amenities aboard a 14-night coast-to-coast cruise that takes you through the world-famous Panama Canal and calls upon 4 blissful port cities in Mexico and Columbia, before you land in San Diego.